This morning, the New York Post ran covers for the September issue of Superior Spider-Man, featuring guest star Miguel O'Hara--Spider-Man 2099. 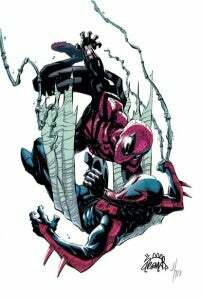 The cover at right comes from the New York Post, but writer Dan Slott talked to Newsarama about fans who are still upset over the direction of Superior Spider-Man: "You just have to sit back and go, ‘You just saw Empire Strikes Back. Han just got frozen in the Carbonite. Luke got his hand cut off. It's not the end of the story.’ This is serialized fiction. Have any of you people read comic books? You've just got to hang in there." No solicitation information is shared in the piece, only the covers, meaning that it's still not totally clear how it is that the time-lost wall-crawler comes into conflict with Doc Octospidey. We'll have to see as it plays out.